The icy season has settled over the mouse territories. The Mouse Guard are short of food and medicine. The small band of adventurers has been forced to split up, leading them to terrible choices. The elder mouse Calanawe tells his young companion Leiam, "You should always aim to be your own mouse." Scarcely recovered from Midnight's Rebellion, the Mouse Guard find that the winter of 1152 falls hard upon the Mouse Kingdom. Their leader Gwendolyn is forced to send her elite Guards--Saxon, Kenzie, Lieam, and Sadie--forth from Lockhaven to the other Mouse Territories to beg them to send food and medical Elixir back to her stronghold. And the Mouse band struggles bravely onward, reaching their Mouse Outposts and obtaining sustenance and two bottles of Elixir to take back to Gwendolyn and the gravely ill Rand. But the strength of the winter storms force the group to tunnel under the snow, where they fall into Darkheather, the underground redoubt of their former enemies in the Weasel Wars, and where they are menaced by the hungry and vicious bats below. Celandawe and Lieam are chosen to press on to their home base with the vital supplies, but they soon find themselves face to face with a terrible predator, the Owl who flies by night and who has a vendetta against all mice since Kenzie's powerful sling scored a direct hit which robbed him of the sight of one of his eyes. Lieam is young, brash but brave, and with his black axe in hand is foolish enough to take on the Owl alone. Celandawe, the wise old warrior, has counseled him to be his own mouse, but the elder's ultimate courage, sacrifice, and loyalty to all mice also teach him that the greatest deed is to put the needs of all before our own, to "serve the greater good." John Peterson's new graphic novel, Mouse Guard Volume 2: Winter 1152 (Mouse Guard Graphic Novels) (Archaia, 2009) is a beautifully illustrated sequel to his earlier Mouse Guard Volume 1: Fall 1152 (Mouse Guard Graphic Novels) (v. 1). 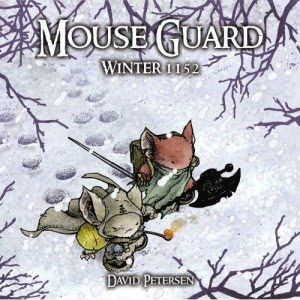 Medieval warfare adventure combined with the stuff of middle earthian fantasy, Petersen's comic-style stories are a bit short on dialogue and storytelling detail, but his gorgeous cinematographic illustrations, here tempered to an icy palette by the snowy winter setting, leave other, cruder mangas and graphic novels in the dust stirred up by his fierce mouse warrior heroes. Sequel to follow.